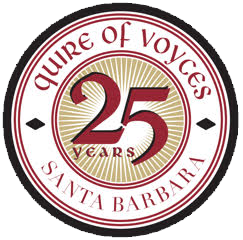 Quire of Voyces | A "voluptuous tapestry of sound, vocal purity and radiant sonorities"
Auditions will be held for new voices to join this premier a cappella group in Santa Barbara on August 27, 2018 at 7pm. Please contact Artistic Director Nathan Kreitzer nathankreitzer@gmail.com. Enter our Ticket Giveaway! Click here to enter. Don’t miss this season’s Quire concerts. Get your tickets now! Check out our growing discography, which now includes two Christmas CDs that make great gifts. Be part of a wonderful community of music lovers who help the chorus achieve its goals! Your financial support allows the Quire to continue bringing the best in a cappella music to our community.